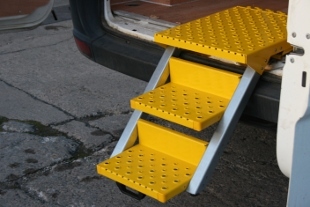 The demand for vehicle steps has changed over the last few years. Initially the requirement came from those in the care sector in vehicles such as ambulances; here stability and reliability are of the utmost importance. The shift in need has happened over the last 2 or 3 years, and has seen demand from taxis and utility vehicles match the care sector. The requirement from these steps is slightly different to those of the care sector. Users of utility vehicles will often need a lot of heavy equipment to carry out their work. This not only means the step will be taking more load but there is likely to be multiple trips to and from the vehicle. This regularly and tough usage is something that needs to be taken into account when the step is built. AVS Steps have been providing commercial steps for over 15 years and understand what is needed from a step in the industry working with clients such as BT Fleet, National Grid, Severn Trent Water, Scottish Water and Wales and West Utilities, the BBC and the MOD. Steps from AVS are created with a wide variety of vehicles in mind. Not all vans or other workhorse have the same ride height, to over come this problem AVS supply a multitude of steps. These are based on the T and D step types and can accommodate single, double, treble and even quadruple steps depending on the distance from the floor. Professional AVS engineers can fit these steps to any vehicle on site. More often than not the standard steps will fit, however if this isn’t the case we can modify existing designs to suit tour vehicle and specification.